Background Component of the BRCA1-A complex, a complex that specifically recognizes 'Lys-63'-linked ubiquitinated histones H2A and H2AX at DNA lesions sites, leading to target the BRCA1-BARD1 heterodimer to sites of DNA damage at double-strand breaks (DSBs). 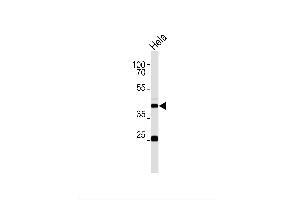 The BRCA1-A complex also possesses deubiquitinase activity that specifically removes 'Lys-63'-linked ubiquitin on histones H2A and H2AX. In the BRCA1-A complex, it acts as an adapter that bridges the interaction between BABAM1/NBA1 and the rest of the complex, thereby being required for the complex integrity and modulating the E3 ubiquitin ligase activity of the BRCA1-BARD1 heterodimer. Probably also plays a role as a component of the BRISC complex, a multiprotein complex that specifically cleaves 'Lys-63'-linked ubiquitin. May play a role in homeostasis or cellular differentiation in cells of neural, epithelial and germline origins. May also act as a death receptor-associated anti- apoptotic protein, which inhibits the mitochondrial apoptotic pathway. May regulate TNF-alpha signaling through its interactions with TNFRSF1A, however these effects may be indirect. Buffer Rabbit IgG in phosphate buffered saline (without Mg2+ and Ca2+), pH 7.4, 150mM NaCl, 0.02 % sodium azide and 50 % glycerol.